If your dreamscape garden is a grand and joyful jumble of foliage and blossoms, plants seamlessly blending into others in a happy mix of color, texture and form, think cottage gardens. What is a cottage garden? It's a garden free of rules. This rough-and-tumble garden style was started by English smallholders, who packed in a wild variety of plants to make the most of their space. Today, it's a popular style for gardeners who want to let their flowers mingle with other species. Some cottage garden plants require skill and effort. But you can get the same charm in your backyard with rambling pathways and a handful of traditional garden plants that are also easy plants to grow. Try these on for size. 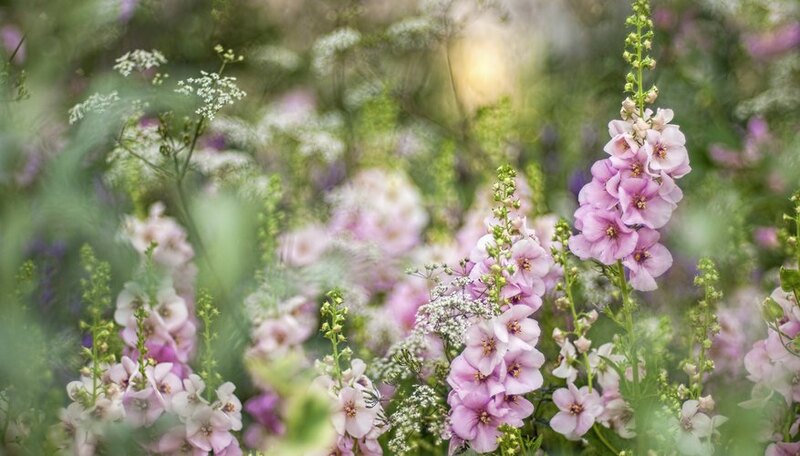 Blue, pink, purple or white – delphinium cultivars grow showy flower spikes to 6 feet tall. You can get blossoms in many shades, but pick the pastels for the allure of a gardener's cottage. 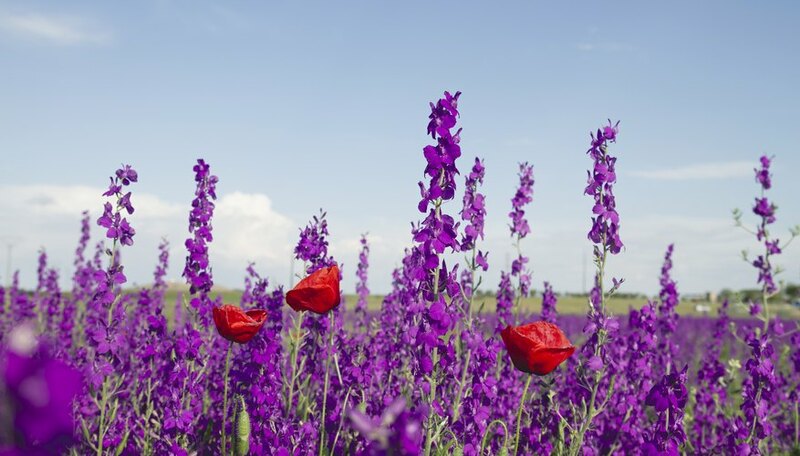 Use delphiniums in borders or against a sunny wall, perhaps mingling with iris and peonies. They grow best in USDA hardiness zones 3-7. In a cottage garden, your tall shrubs or trees serve as focal points, adding height, structure and visual interest. That's where hydrangeas come in. Hydrangeas are not just gorgeous flowering shrubs, they are virtually carefree, thrive in a wide variety of climates and come in many types. 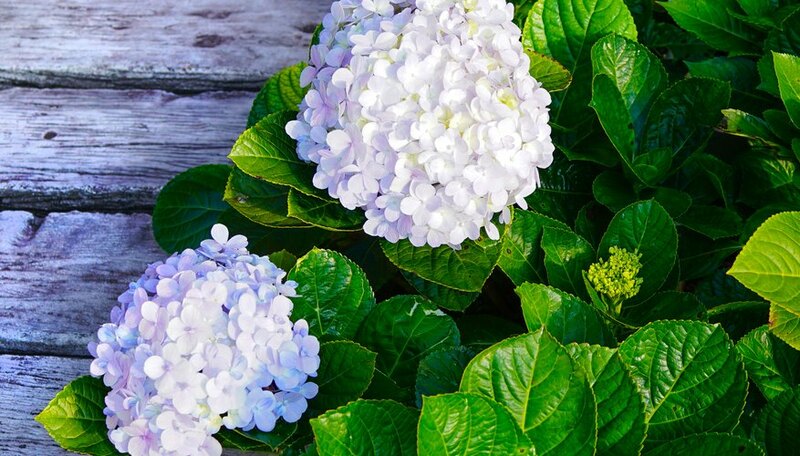 You may be familiar with the color-changing mophead (Hydrangea macrophylla), but that's just the beginning. For a cottage garden look, try the lacecap (Hydrangea macrophylla), with its flat center of tiny flowers, surrounded by lacy bracts. Native oakleaf (Hydrangea quercifolia) offer romantic panicles of loose white flowers. It's been around for centuries, but hollyhock is still considered the quintessential country garden flower. 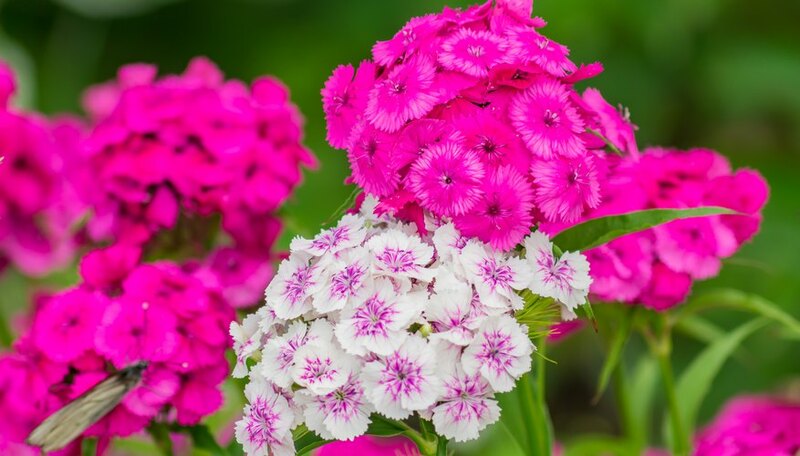 The vibrant flowers grow profusely on all sides of erect stems. They look like hibiscus, with large petals in a range of colors from deep crimsons to blush pinks. 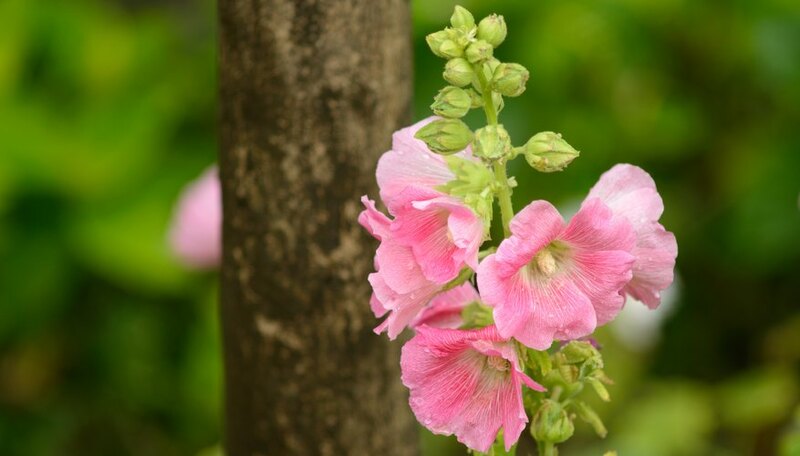 Hollyhocks are easy to grow from seed. Just plant them in a warm, sunny location sheltered from the wind where they'll grow profusely and self-sow readily. 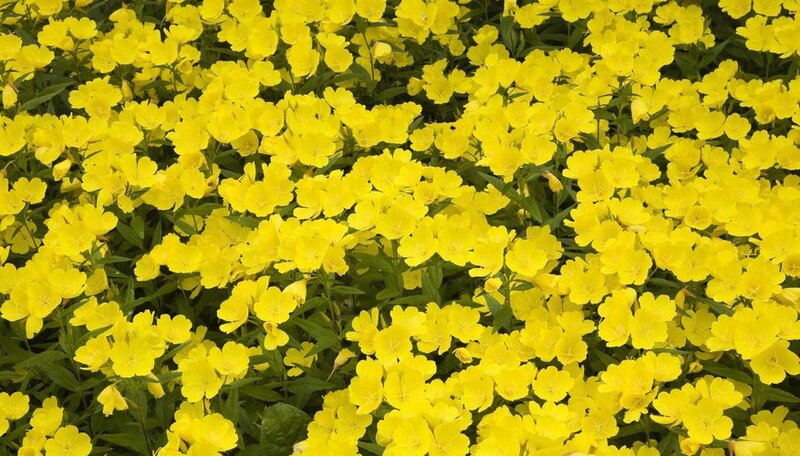 The canary-yellow, satiny flowers arrive in a joyful riot in early spring, and yellow sundrops just keep blooming. They are 2 to 3 inches across and look a little like poppy blossoms growing on mounding green foliage. These plants need sun but otherwise they are easy-as-pie and undemanding. They tolerate drought and any kind of soil. At 1 and 2 feet tall, they look wonderful in a cottage garden in front of taller delphinium and hollyhock. Many of the taller plants for cottage gardens require sun. What to put in partial shade? Catmint, also called catnip, is an excellent choice. Only a few of the 250 species in the Nepeta genus are attractive to cats, but many work well in a cottage garden. The foliage sprawls delightfully, bringing in that happy, messy look you are seeking, and the spikes of flowers keep blooming from spring through fall. 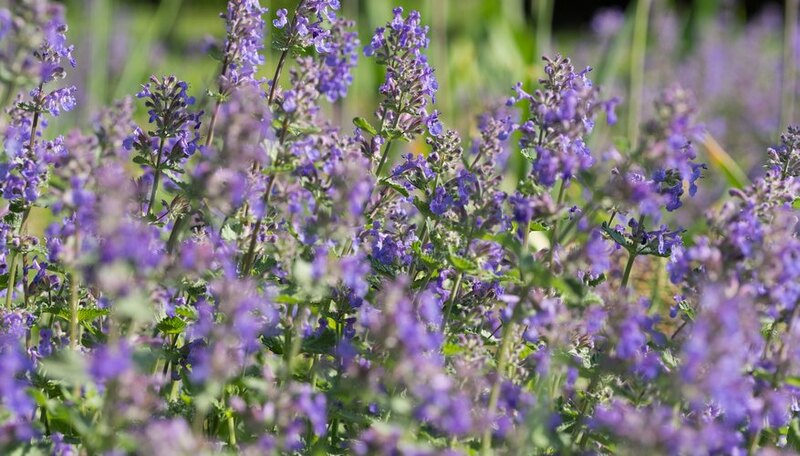 Nepeta racemosa ‘Walker’s Low’ is an award-winning variety with deep purple, velvety blossoms about 30 inches above the ground. For a shorter sprawl, opt for ‘Little Walker,’ a pint size version of Walker's Low. Slender plants with billowy blossoms, garden phlox are American natives. They found their way to Europe, where they became popular in English cottage gardens. Beloved for their long flowering season and easy-care ways, phlox grows fast to 4 feet tall but hardly ever requires staking – or any other active care. You can also find creeping versions that get no taller than 6 inches off the ground. Teo Spengler is a docent with the San Francisco Botanical Garden and a staff writer with Gardening Know How. She has written hundreds of gardening and plant articles for sites like eHow Gardening, Gardening Know How and Hunker. She holds a JD in law from U.C. Berkeley, an MA in English and an MFA in Creative Writing. What Are the Best Times for Watering the Lawn? When Are White Lilies in Season?